Molex's SolderRight Direct Solder Terminals are ideal for tight packaging constraints. The low-profile terminals enable right-angle connections to a PCB at a low applied cost. From laptop computers to handheld devices, electronic systems, products, and packaging are becoming exponentially smaller. Until now, users were forced to either solder a bare wire into a PCB and bend it over (resulting in poor reliability and a higher-profile termination), or use a two-piece connector system (with a higher cost and higher profile). SolderRight™ Crimp Terminals solve both of these issues. 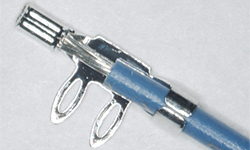 With an industry need for low-profile packaging, reduced wire connections, permanently connected circuits, and higher standards of reliability, SolderRight Crimp Terminals are the only board-in crimp solder options in the market that address all of these points. Molex SolderRight Direct Solder Terminals (.pdf) for more product information, specifications, applications and ordering information.